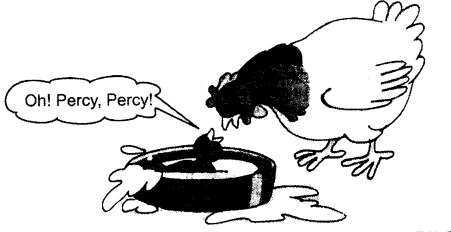 NCERT Solutions for Class 1 English Chapter 6 Lalu and Peelu are part of NCERT Solutions for Class 1 English. 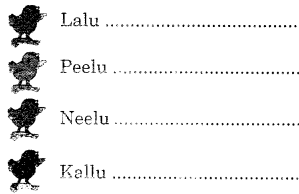 Here we have given NCERT Solutions for Class 1 English Chapter 6 Lalu and Peelu. 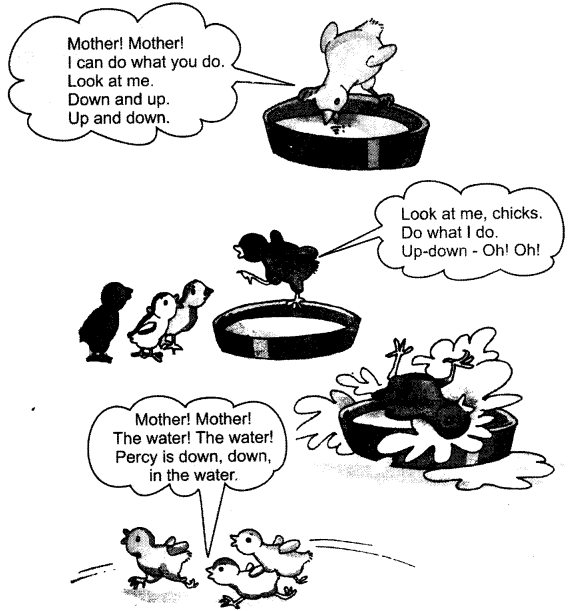 This story is all about a hen and her two chicks, Lalu and Peelu. Lalu was red in colour and he also love red things. Peelu was yellow in colour and he love yellow things. One day Lalu are a red chilli by mistake his mouth started burning. He began to cry loudly. Peelu brought a yellow laddu to help Lalu. Lalu ate the laddu and felt relieved. loved red things. Peelu was yellow. hot. Lalu’s mouth started burning. 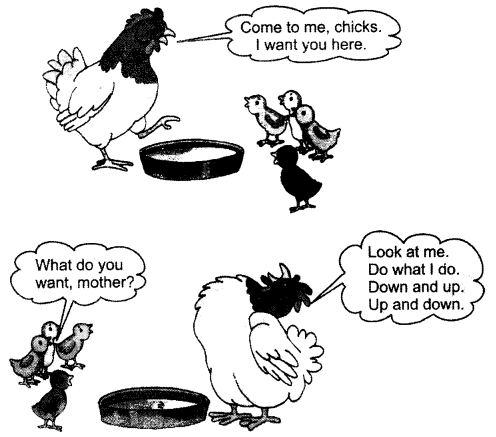 The chicks ran to their mother. पीली वस्तुओं को कौन पसंद करता शा? What did Lalu eat one day? एक दिन लालू ने क्या ख़ाया? He ate a red chilli one day. Peelu brought a yellow laddu for Lalu. What are the other things Peelu could have brought that are both yellow and sweet? Name at least two, e.g., a mango. Lalu loves red things. Peelu loves yellow things. The colour red is called ‘lal’ in Hindi and yellow is called ‘peela’. What do you call these colours in your own language? इन रंगों को क्या कहते हो? Give names to these chicks using the names of some other colours in your language. Trace and colour these flowers. Act out this story with the class. We hope the NCERT Solutions for Class 1 English Chapter 6 Lalu and Peelu will help you. If you have any query regarding NCERT Solutions for Class 1 English Chapter 6 Lalu and Peelu, drop a comment below and we will get back to you at the earliest.